ABSTRACT: This paper explores relationships between musical and balletic structure in Balanchine’s choreographies of Tchaikovsky’s op. 48 Serenade and Stravinsky’s Orpheus. It demonstrates how movement in music (phrase shapes, melodic directions) and movement in ballet (in individuals and in the corps de ballet) may respond to one another, especially in how each art form follows and alters its own conventions. [1.1] Audiences often take in a collective breath upon seeing the curtain rise at the opening of Balanchine’s ballet Serenade, given as Figure 1. Based on Tchaikovsky’s Serenade for Strings, music the choreographer had loved since his childhood, the curtain rises to the formation given in the figure, with the corps de ballet spread across the stage in a striking formation. The curtain rises at the third phrase of music, after two iterations of opening music, and the third begins in the same way. But this time we see seventeen female dancers in five diagonal rows, and each dancer stretches one arm diagonally away from her body with her head turned toward some distant point beyond the stage. [1.4] To what have they been listening? I will suggest that they have been listening to how Tchaikovsky’s repeating phrase falls. 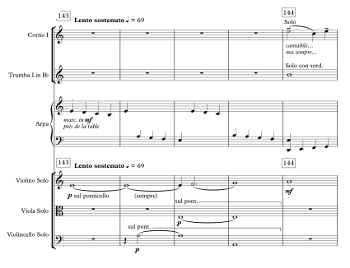 As shown in Example 1, the melody of this “Andante non troppo” tempo strides deliberately downward toward the tonic, although its descending stepwise movement is broken into two stages. Here it will be helpful to look at the voice-leading sketch in Example 2. (4) Across the entire phrase, outer voices move downward in stepwise parallel tenths, transformed in the second phrase (at system 2 of Example 2) into parallel sixths as outer parts are exchanged. Whether in the top or bass voice, however, the melody’s descent stops first on 3ˆ, an arrival first weakened by its harmonization on vi. It then doubles back up to fall a second time, continuing its journey in parallel tenths or sixths to reach an authentic cadence. This double descent strongly implies a closure through the entire scale down to the tonic, a completion interrupted only at the last moment when D rises up to E. The melodic interruption constitutes a reason to repeat the entire phrase, and hence arise phrases two, three, and four (each displayed on succeeding systems of Example 2). Tightly and lushly scored, the melody impels us onward, and as the curtain rises to its third repetition, we experience the palpable tension of dancers’ bodies held still in midstream. When will they move? Will they all move? What will happen to the beautiful symmetry of the diamond? [1.5] Moreover, the music has also begun midstream: like the dancers, whose upper bodies first appear in a partial pose, the musicians begin on vi, in the middle of an emerging C major key area. The return to vi in the middle of the phrase becomes a reminder of that stylized beginning. Even in the second phrase, when a complete octave descent takes place in the bass, omitting the tonicization of vi, melodic closure is still denied. As the phrase begins a third time (on system 3 of Example 2), once again on vi, and now with the dancers in full view, we, as well as they, are primed for movement: this third initiation is imbued with energy, even as the dancers remain still. Our sense of anticipation is high: we cannot take our eyes away from the stage as we listen for the third repetition of the phrase to unfold. [1.6] And the third phrase does not disappoint. This time, as if the music is responding to the dancers’ perfect stillness, it too stops short. 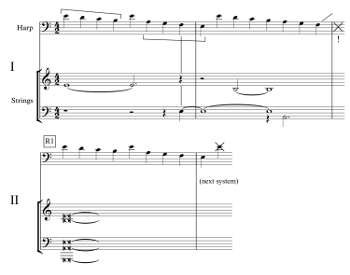 As shown on the third system of Example 2, a half cadence on the dominant of vi (at the exclamation mark) comes early, in the sixth bar of a phrase that has normally lasted eight bars. After this surprising turn, the third phrase must again re-begin, this time from the very beginning, as shown in the fourth system of Example 2. [1.8] Martha Graham, whose modern-dance choreographies are in many ways a critique of twentieth-century ballet, claims that tears filled her eyes when the dancers’ feet “snapped into first position.”(7) Now the dancers have fully learned “how to be on stage:” even their feet have reached completion, and now too they have cadenced. Now that they are truly ready to dance, to move away from their spots, the music too is ready to begin its proper first theme. [1.9] This analysis invites us to hear Tchaikovsky’s music and Balanchine’s choreography as a partnership. Pairing music and ballet’s singular ways of moving and being still, it finds a neoclassical elegance in the way each art form is heard and seen in relation to the other. We have seen a descending melody enliven a tonic prolongation, with carefully aggregated bodies filling out the stage. The unbalance of their pose cries out for movement as the music re-begins with phrases and as phrases repeat. As the dancers finally begin to move, the music retraces its steps only to find a new harmonic goal, one whose elongation supports them as they too ready their bodies for the main body of Tchaikovsky’s movement. 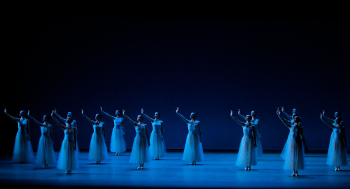 [2.2] Balanchine’s stylistic gestures, such as limited, precise bodily movements, poses that expose the body, sudden changes in pace within the body, and the contrast of movement and stillness, all key features in the Serenade, became even more prominent in his collaboration with Stravinsky in the 1948 Orpheus. (10) While the music for Orpheus is familiar to musicians, the ballet received decidedly mixed reviews, due in part to its limited, non-virtuosic choreography. (11) Its opening is a case in point: for more than two minutes, Orpheus stands motionless with his back to the audience. Alastair Macaulay has written that the silent beginning is a hallmark for Balanchine: “Most Balanchine ballets begin with a tableau, as if movement had been interrupted. When movement does begin, it’s usually timed to take you by surprise,”(Macaulay 2016) an observation confirmed abundantly in key moments of this ballet. During Orpheus’s stillness, a symbol of his grief, we hear repetitions of the familiar opening, a manipulated descending Phrygian melody, as shown in Example 3, where each of the manipulated repetitions is identified by a new system of music. [2.4] Even though Orpheus does not move in the first scene, we experience, and he hears, the movement of a melody striving to complete a direct descent through the Phrygian scale. Consider the opening bars, given in Example 3: the opening lament tetrachord, attempts to repeat itself, but a return to E is followed by a skip down to A. That succeeding tetrachord completes the Phrygian scale, but not directly, and the nearly complete scale that follows cannot complete a move to the lower E. Instead it is interrupted by another lament tetrachord, and the cycle begins anew. On Example 3 the alignment of the varied repetitions shows how arrivals on the lower E come only from A (rather than an upper E), and that descents from the higher E always fail to reach the lower E.
[2.5] As with Serenade, we feel the tension accumulating as continued melodies point to where Orpheus needs to go—that is, to the Underworld. While Orpheus remains still, Stravinsky’s music remains confined but urgent in its movements. The re-beginnings of the melody, and their continued failures, become more pressing as Orpheus does not move. At the very end of this example, where a move to a lower register signals the Underworld to which Orpheus will soon travel, the descending melody stops for the first time, but on F rather than E, a stunning case of movement denied, as if even the music has given up on urging Orpheus to move. [2.6] The only physical movement in this opening scene comes from Orpheus’s friends, who try to comfort him with an inanimate stick figure representing his dead wife Eurydice. Responding to the music and to Orpheus’s grief, their movements are confined to steps, but these are not typical balletic steps. Instead of moving toe to heel, these supposed dancers walk heel-to-toe, denying their powers as dancers. Nothing in this scene moves in a typical way. Here is the consummate musician, whose music can cause even rocks to move, seemingly deaf and paralyzed with grief. His lyre remains silent on the ground, and ultimately, the music itself stops its repetitions. The music has failed. (14) And so will Orpheus. During the course of the ballet, having failed to return Eurydice to life, Orpheus dies a hideous death, and thus in the final movement, entitled “Orpheus’s Apotheosis,” the leading dancer is not even present. [2.7] But his music returns. My final discussion describes how rising and falling steps, both in dance and music, exquisitely shape the ballet’s end. On Example 4a, the opening of the final movement, Orpheus’s theme finally completes a Phrygian scale at R144. From there, it begins to rise, now on D, as if responding a slower, more tentative rising melody in violin and trumpet. Something is afoot: we have reason to anticipate a responding movement on stage. In fact, Apollo, Orpheus’s father, enters carrying a greatly enlarged version of Orpheus’s mask, the item whose removal caused the deaths of both lovers. Apollo moves by step to stepwise melodies, but notably his steps are balletic, moving properly from toe to heel. Balanchine, George. 1947. “The Dance Element in Stravinsky’s Music.” Dance Index 6, no. 10–12: 250–56. http://eakinspress.com/danceindex/issueDetail.cfm?issue=danceindexunse_30. Balanchine, George. 1968. Balanchine’s New Complete Stories of the Great Ballets. Doubleday and Company. —————. 1968. Balanchine’s New Complete Stories of the Great Ballets. Doubleday and Company. Boris, Ruthanna. 2008. “Serenade.” In Reading Dance: A Gathering of Memoirs, Reportage, Criticism, Profiles, Interviews, and Some Uncategorizable Extras, ed. Robert Gottlieb, 1063–69. Pantheon Books. Croce, Arlene. 2009. “Balanchine Said.” New Yorker Magazine, Jan. 26, 2009. http://archives.newyorker.com/?i=2009-01-26#. Homans, Jennifer. 2010. Apollo’s Angels: A History of Ballet. Random House. Joseph, Charles. 2002. Stravinsky and Balanchine: A Journey of Invention. Yale University Press. Macaulay, Alastair. 2016. “ In Balanchine’s ‘Serenade,’ Rituals and Gestures of Autonomy.” New York Times, Oct. 6, 2016. https://www.nytimes.com/2016/10/07/arts/dance/in-balanchines-serenade-rituals-and-gestures-of-autonomy.html. —————. 2016. “ In Balanchine’s ‘Serenade,’ Rituals and Gestures of Autonomy.” New York Times, Oct. 6, 2016. https://www.nytimes.com/2016/10/07/arts/dance/in-balanchines-serenade-rituals-and-gestures-of-autonomy.html. Michelman, Fran. 2007. “Marius Petipa.” http://www.abt.org/people/marius-petipa/. Nabokoff, Nicholas. 1949. “Christmas with Stravinsky.” In Stravinsky, ed. Edwin Corle, 123–68. Duell, Sloan, and Pearce. Nabokov, Nicholas. 1952. Old Friends and New Music. Little Brown. Phillips, Tom. 2004. 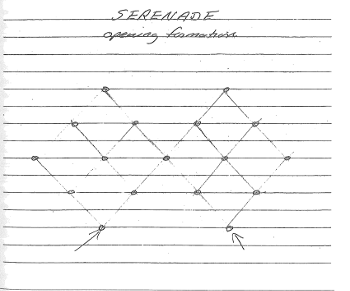 “Unblocking the Moonlight: Reflections on Serenade.” DanceView Times, Aug. 9, 2004. http://archives.danceviewtimes.com/2004/summer/06/serenade.htm. Steichen, James. 2012. The Stories of Serenade: Nonprofit History and George Balanchine’s “First Ballet in America.” Center for Arts and Cultural Policy Studies. Stravinsky, Igor. 1970. Poetics of Music in the Form of Six Lessons. Harvard University Press. Volkov, Solomon. 1985. Balanchine’s Tchaikovsky: Interviews with George Balanchine. Translated by Antonina W. Bouis. Simon and Schuster. * Note to readers: Copyright restrictions do not permit a direct reproduction of the videos of the ballets described below. Instead I provide time locations for a published DVD of the two ballets, as well as youtube links where available. Note to readers: Copyright restrictions do not permit a direct reproduction of the videos of the ballets described below. Instead I provide time locations for a published DVD of the two ballets, as well as youtube links where available. 1. Boris 2008, 1064. The diagram is reproduced on 1067. The arrows show where she and another dancer (Annabelle Lyons) each stood. The diagram is also reproduced in Steichen 2012. He remarks that “. . .the arrangement served to emphasize the corps as figure instead of ground, a hallmark of the Balanchine aesthetic, which disapproves of excessive focus on star dancers” (12). 2. Sorrin 2013. Balanchine recounts how seventeen dancers showed up to the first class he offered, and how that group became the configuration. 4. I thank my colleague Frank Samarotto for helping me create this sketch. 6. This version of Serenade features Darci Kistler. Unfortunately, the credits for the video are shown as the music begins. A second performance (from a New York City ballet production in 1957) is available commercially; the DVD “New York City Ballet in Montreal, Vol. I” (DVD 4571 by Video Artists International). The introduction runs from 0:38 to 2:47. 7. Macaulay 2016. The entire quotation is “Martha Graham, seeing ‘Serenade’ for the first time, said her eyes filled with tears when the women suddenly all turned out their feet, heels together, into ballet’s first position: ‘It was simplicity itself, but the simplicity of a very great master—one who, we know, will later on be just as intricate as he pleases.’” Phillips 2004 also mentions this story. 8. See Michelman 2007 for a short introduction to Petipa’s work. 9. Croce 2009. Similarly, Balanchine 1947 recounts “It was in studying Apollo that I came first to understand how gestures, like tones in music and shades in painting, have certain family relations” (255). 13. The three ballets in the trilogy are Apollo (1928), Orpheus (1947), and Agon (1957). 14. The ballet is commercially available on a DVD (“New York City Ballet in Montreal, Vol. I,” DVD 4571 by Video Artists International); it is taken from a New York City ballet production in 1957; the opening music is at 30:35–32:55. 15. Nabokoff 1949 recounts “Here, you see, I cut off the fugue with a pair of scissors. . .I introduced this short harp phrase, like two bars of an accompaniment. Then the horns go on with their fugue as if nothing had happened. I repeat it at regular intervals, here and here again. . .You can eliminate these harp-solo interruptions, paste the parts of the fugue together and it will be one whole piece” (146). 16. On DVD 4571 by Video Artists International; the closing scene occurs at 55:45–58:38. Boris 2008, 1064. The diagram is reproduced on 1067. The arrows show where she and another dancer (Annabelle Lyons) each stood. The diagram is also reproduced in Steichen 2012. He remarks that “. . .the arrangement served to emphasize the corps as figure instead of ground, a hallmark of the Balanchine aesthetic, which disapproves of excessive focus on star dancers” (12). Sorrin 2013. Balanchine recounts how seventeen dancers showed up to the first class he offered, and how that group became the configuration. I thank my colleague Frank Samarotto for helping me create this sketch. This version of Serenade features Darci Kistler. Unfortunately, the credits for the video are shown as the music begins. A second performance (from a New York City ballet production in 1957) is available commercially; the DVD “New York City Ballet in Montreal, Vol. I” (DVD 4571 by Video Artists International). The introduction runs from 0:38 to 2:47. Macaulay 2016. The entire quotation is “Martha Graham, seeing ‘Serenade’ for the first time, said her eyes filled with tears when the women suddenly all turned out their feet, heels together, into ballet’s first position: ‘It was simplicity itself, but the simplicity of a very great master—one who, we know, will later on be just as intricate as he pleases.’” Phillips 2004 also mentions this story. See Michelman 2007 for a short introduction to Petipa’s work. Croce 2009. 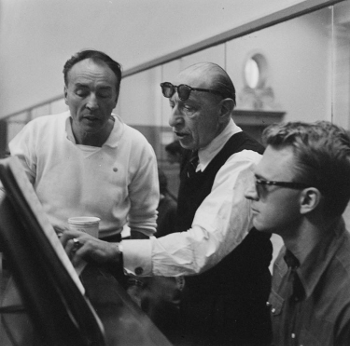 Similarly, Balanchine 1947 recounts “It was in studying Apollo that I came first to understand how gestures, like tones in music and shades in painting, have certain family relations” (255). The three ballets in the trilogy are Apollo (1928), Orpheus (1947), and Agon (1957). 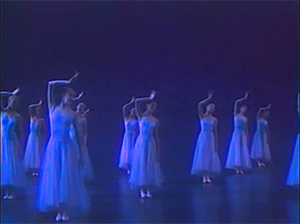 The ballet is commercially available on a DVD (“New York City Ballet in Montreal, Vol. I,” DVD 4571 by Video Artists International); it is taken from a New York City ballet production in 1957; the opening music is at 30:35–32:55. Nabokoff 1949 recounts “Here, you see, I cut off the fugue with a pair of scissors. . .I introduced this short harp phrase, like two bars of an accompaniment. Then the horns go on with their fugue as if nothing had happened. I repeat it at regular intervals, here and here again. . .You can eliminate these harp-solo interruptions, paste the parts of the fugue together and it will be one whole piece” (146). On DVD 4571 by Video Artists International; the closing scene occurs at 55:45–58:38.